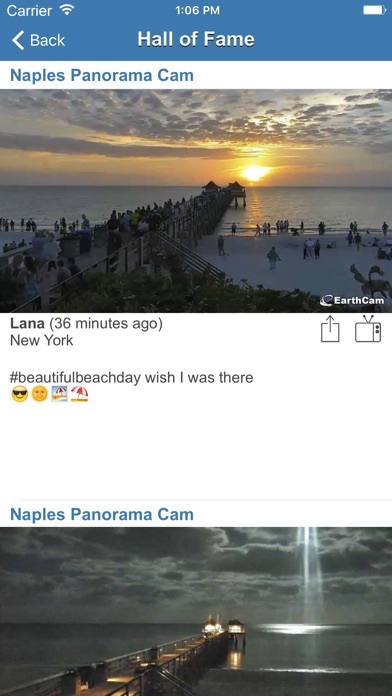 With EarthCam’s Webcams app, you can travel the globe, visiting scenic and landmark destinations via our unique network of live HD streaming video and megapixel snapshot cameras. Explore the Hall of Fame to enjoy the best image archives submitted by EarthCam.com visitors and share your favorites via Facebook, Twitter, Instagram, iMessage and email. Have top destinations you like to visit? Create a personalized list of favorite webcams for a customized experience! 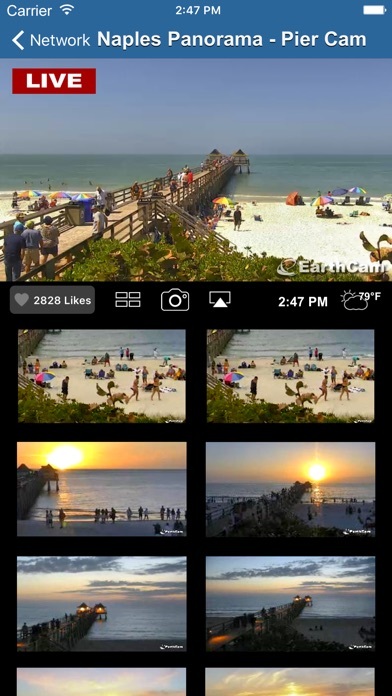 We’ve recently enhanced the user experience by including all of EarthCam’s cameras in the “Buy All” package! For one low price, you can access more than 175 webcams, as well as any added in the future. As a “thank you” to our fans who have been with us since the beginning and purchased one or more packages, we are unlocking the “Buy All” feature automatically, letting you travel to any EarthCam destination for no additional fee! Please note: some streaming cameras may take a moment to load based on your internet connection. A camera marked with “HD” denotes a live streaming camera. A camera marked with “MP” denotes a megapixel photography camera, which shows a high resolution updating image. Webcams listed are subject to availability and may change from time to time. New views are added regularly, so be sure to check back for new releases. Where are all the cameras??? Purchased “All cameras” so I could see views of the National Mall as linked to by the National Park Service and the White House web pages. There not on the list and no others from DC are there. Total waste of money. Saving to the Hall of Fame option doesn’t always show up on iPad. This is probably the best webcam app available for iOS. I am happy that I decided to upgrade. Yes, more cameras would be nice, but at last count there were slightly less than 200 cameras. Not too shabby. 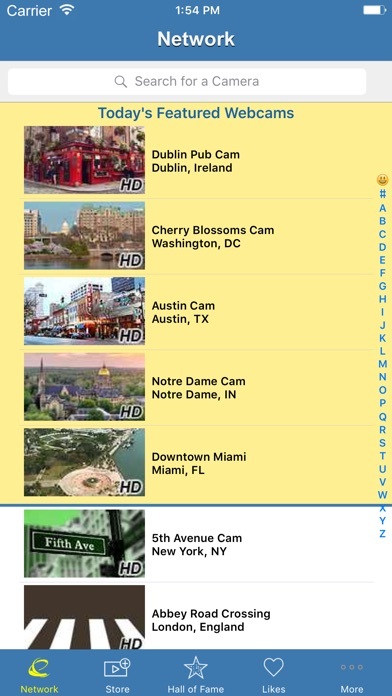 Can the cameras saved as "likes" be rearranged alphabetically? The edit button doesn't seem to work. I think earth cam is doing a wonderful job with all the cameras all over the world. When I don’t like is all this hostility and gabbing in their little notes underneath the still photos. Namely these people go by the name of: Ann Byrd (a Cherokee Indian) from Longview, Texas “Who is the ringleader of this hate group as well as this Will Wright) - another very hateful person who leaves hateful threats is: “Sean n” from Poughkeepsie New York that should be stopped immediately and account closed!! !/Delilah/TPBGril/Jessica/Nancy/Will/Sara/Sean n from Poughkeepsie New York/Valerie... they go to the Andy Warhol Cam/Michigan snowman Cam and the Dublin Cam. Their hostile to other viewers with threats of hate and are very rude with their words, some very dangerous talking going on here. Photocopies of all there chatter have been delivered to the FBI for to investigate for the possible hate crimes case. They should be dropped immediately from EarthCam. If they can’t say something nice about people than they shouldn’t say anything at all. 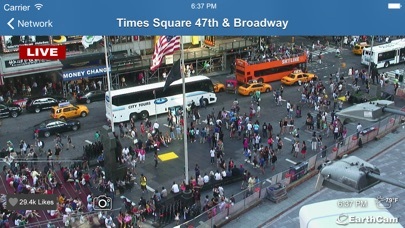 I think EarthCam should shut this texting down completely. Most of their members are Facebook accounts and have gradually been disappearing due to Facebook dropping them for hostile talk of hate. I have been reviewing this nonsense for the past two months and have concluded that this is very unhealthy and dangerous and could create very big problem. EarthCam is responsible for this problem that they have created and all evidence gathered has been turned over to the FBI cyber division for an investigation for possible hate crimes. 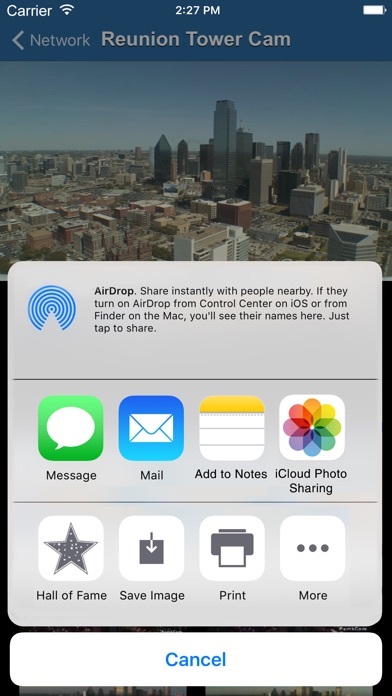 Updated IOS, cams not working. Tried to open earth cam and all I get is a message that it is “ uploading data” , then a message that I need to “turn on cel data or use internet”. I am connected to the internet yet continue to get this message. Do not get the app or subscribe to it until problem is fixed. After the last update the App is completely broke, can’t reach their website or App Support. Please bring back the burrowing owls. Miss them.